Information can be shared in many different ways. The way you convey information will depend not only on what you want to convey but also your target group and the location. Do you have a permanent, central place in your school, office, shop or restaurant where information is displayed for pupils, colleagues, customers or diners? Our information boards and floor display systems offer an effective solution for this. 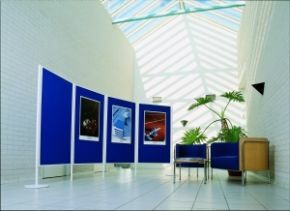 Showcases and poster frames are an ideal solution for putting your information in front of a specific target audience. You will have come across our information products everywhere. You may have seen them in council offices, schools and associations where our floor display systems have been used in various combinations for many years. You will probably have seen our information boards in hotel receptions or in use as room dividers in conference centers and exhibition halls. Our poster frames are often used to display advertisements in schools (not to mention in nightclubs where you frequently find them on the backs of toilet doors, for example). So you see, Legamaster information products are everywhere! It's not surprising that you can find our information products everywhere. That’s because they are designed to suit any situation. At Legamaster, you won't have a problem finding a solution for your particular situation. Want to find out more about sharing information using Legamaster products? Discover our wide range under ‘Products’ and find the information products that you've been looking for. Got a question or need specific advice? Please contact us. We will be happy to help you choose the information products that are right for you!